Overall: The Amana ABB2224WES bottom freezer refrigerator is one of the few refrigerators in this class that can adequately service the typical family of four. At first glance, the fridge doesn't seem like it can hold anywhere near as much as it does. The doors are very well designed with gallon door storage. This allows you to store many of your larger items in the door, saving the shelf space for smaller, sometimes harder to find items. Energy Efficient: This Amana refrigerator is Energy Star rated to help you save on your energy bills and to be a bit more earth conscious. Great Storage and Organizational Features: This fridge is unique in that there seems to be space for just about anything. From gallon door storage, to specialized produce crispers, a deli drawer for meats and cheeses as well as a dairy center in the door. Typically, refrigerators of this size and in this price range simply don't have these options. 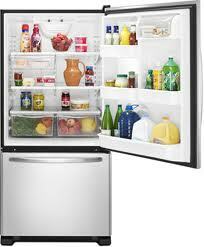 Efficiency: We are happy to say that this Refrigerator IS Energy Star rated. MSRP: It was originally $1599 for the stainless steel model and a few hundred less for the other finishes. Before it was discontinued we were able to find it for 20-25% off of the MSRP. If you feel this fridge is still the perfect fit for you, take a look at the current bottom freezer models from Amana (they truly never really end up being that much different from year to year except trying to improve on what they've done in the past) or see if you can find a used version. *Tip: Just be aware that refrigerators being made today aren't made like they used to. The life expectancy for a typical fridge is 7-10 years so if you are looking at one that is 5 years old, you'll be lucky to get another 2-5 out of it. You'll want to take that into consideration when bargaining down the cost. This model is a great one to consider (especially because Amana called it their "best" bottom freezer) but just in case you are looking for a newer model we’ve included more bottom freezer reviews that are worth taking a look at. Of course things break down over time with refrigerators (and seemingly faster than ever before!) though quite often the fixes are easy. If you'd prefer to try and fix your Amana ABB2224WES refrigerator instead of buying a new one, we suggest you take a look at Amana's Part Center to see if they have what you need. If they don't, then don't give up all hope. Reach out to them to see if they have any suggestions on where else you can look to find it.